Beverly Hills, CA – It appears as an upscale doctor’s office in the tony Southern California community of Beverly Hills. Photos of the interior of the office show lighted artwork on the walls and furnishings that would make a woman of means feel at home. 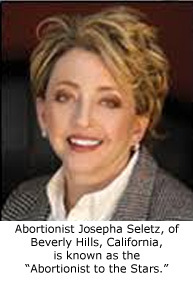 In reality, the Pro-Choice Medical Center, owned and operated by “Abortionist to the Stars” Josepha Seletz, is a very late-term abortion facility with a worrisome safety record. Operation Rescue has obtained 911 records related to two medical emergencies that occurred there so far this year. Previously obtained records document at least three more such incidents within the past two years. The most recent call to 911 took place on May 3, 2017. The recording indicates a 33-year old female had just completed an “outpatient pregnancy termination” and required emergency care for bleeding after the abortion. “Patient had an outpatient pregnancy termination and we’re trying rule out a little bit of DAC at this point so observation,” the caller from the abortion facility said. The fact that the caller indicated there had been a “fetal demise” indicates this was likely a late-term abortion. The woman was transported to Cedars-Sinai Medical Center where Seletz holds hospital privileges. 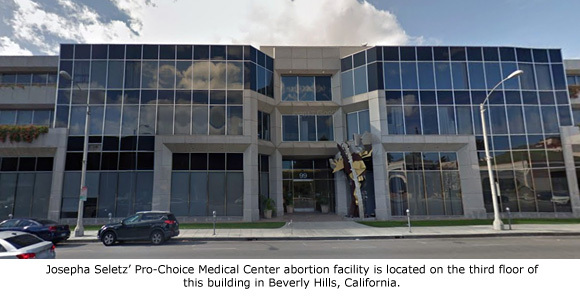 Another 911 recording showed that a medical emergency took place at the Pro-Choice Medical Center on April 18, 2017, which sent another woman to Cedars-Sinai for emergency care that could not be provided at Seletz’s abortion facility. “We are an outpatient surgery facility. We had a patient who had a second trimester pregnancy termination and that Dr. Seletz has ruled out at this time that it’s a probable DIC or she’s just bleeding with uh ya know, we’ve been observing her for a couple of hours but there’s no stop,” the caller explained to the 911 dispatcher. Operation Rescue previously obtained Computer Aided Dispatch printout from three other medical emergencies at Seletz’s late-term abortion facility. Those 911 incidents took place on November 4, 2015; December 2, 2015; and June 29, 2016. While those documents contain scant information, they do note that all three patients were transported to Cedars-Sinai Medical Center, which is an indication they required further medical attention. Seletz offers only one service at her Pro-Choice Medical Center, and that is abortion. She is one of the few abortionists in the U.S. who openly admit to conducting abortions throughout all nine months of pregnancy. She was trained in late-term abortions by the late Jim McMahon at the now-shuttered Eve Surgical Center, which once covertly offered late-term abortions in the Los Angeles area. McMahon was the true inventor of the now banned partial birth abortion procedure, which he developed in secret by experimenting with new abortion techniques on his patients. Even though California law restricts abortions after 24 weeks, exceptions allow Seletz to offer the high-end third trimester abortions for cases of “fetal anomaly.” Such abortions, which can be exorbitantly expensive, but Seletz admits to callers that her fees are higher than competitors. Prior to 24 weeks, Seletz will conduct abortions on healthy babies for any reason without restriction. According to information documented by Abortion Free New Mexico, Seletz charges $6,700 for a 23-week abortion and $7,250 for abortions at 24 weeks. In the third trimester, Seletz uses the Induction Abortion method perfected by abortionist George Tiller of Wichita, Kansas. This three to four-day procedure involves an injection of Digoxin into the pre-born baby for the purpose of causing the baby’s death. The woman is then prepared for the final step of the abortion, which is removal of the baby’s remains through dismemberment or the expulsion of the dead baby’s intact body through the process of labor and delivery. However, such procedures are fraught with often-dramatic, life-threatening risks, which increase with each week of pregnancy. Read CAD printout for May 3, 2017 emergency. Read CAD printout for April 18, 2017 emergency.